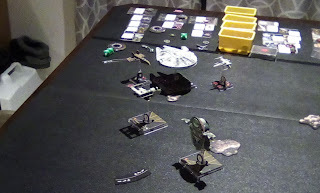 The goal of X-Wing is to cause more damage points to your opponent’s squadron then they do to your squadron. In the case of a game without a time limit this simply becomes: destroy them before they destroy you. However, your goal is not your strategy nor the tactics that you will use. What is strategy? Surprisingly this is not an easy answer. Over the years, I have met several people who consider themselves military professionals and most of them have similar but different definitions for the term. For the purpose of this article, strategy is the path to your goal. Now onto the next question, what is Tactics? Once again tactics is a rather nebulous idea but it is essentially the building blocks from which you build a course of action. It is perhaps better described as a collection of Tactics, Techniques, and Procedures (TTP) used to get you down the path to your goal. 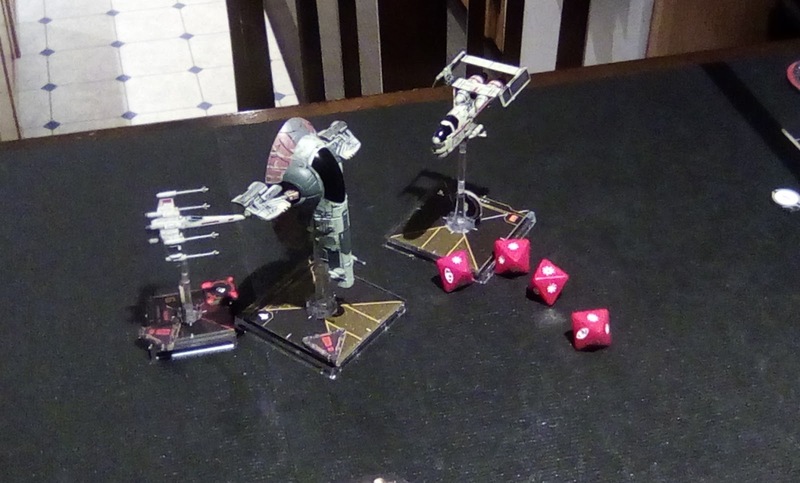 In X-Wing the goal (unless you are playing a scenario) is constant and described above. 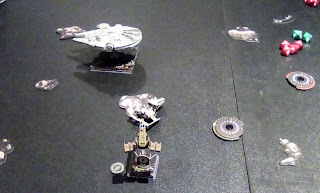 There are, however, a few different strategies (here are three); force a culminating engagement (decisive joust, best done with lists that have significant firepower), Isolate (out maneuver) a portion of your opponent's squadron and destroy them piece-meal (often done by arc-dodging lists), or sneak a few points and run out the clock (done well by turrets and bombs). Underpinning all of this is an efficiently made list. If you want to make a jousting list but choose engine upgrade at the cost of one more ship, then you might want to re-think what strategy you are going for. Here is the problem with your strategy; your opponent gets a vote. If you want to isolate and destroy them piece by piece but they are flying a swarm and executing their plan like a highly trained NFL special team then your strategy may not led to your goal. Strategies must be realistic and flexible enough to take advantage of as many opportunities as possible. If we look back at the special team, can you rush one flank before they close the net on you? Or perhaps once you K-Turn behind them they will no longer have the ability to keep the formation. If both sides have workable strategies it will come down to tactics. As said before tactics are your building blocks. 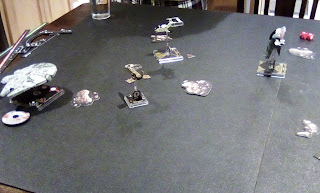 A classic tactic for low pilot skill ships is to take the focus action before any other available option, it is useful for offence and defense and does not require the enemy to be in engagement range when you take the action. Other tactics are how you set up your force, the less mobile your squadron then the closer they should start together. Or if certain ships give advantages to other ships then how you position them becomes a tactical consideration. Once again, these considerations are not made in isolation but only after considering the enemy. If you are slow but they are slower, then you could spread out a bit. If you opponent has ordnance, why bother keeping your support ship at range three? It would be safer at range one. My list this time is called “Han and Friends”. The impetus of this list and the confirming bias I am using to substantiate it is coming from a game of legion I played many months ago. I noticed that in legion, FFG made our beloved characters, from the movie, very powerful. Since the second edition came out after legion, I assumed they would continue the trend. Strategy of this list. This list is only two ships with only 3 green dice between them, the X-Wing isn't fast enough to run away and they don't have enough red dice for a straight joust. They have to isolate the enemy and destroy them piece by piece. Which they can do as they both move last and Han can bump a ship to take that enemy out of the picture (for him) and still get full mods. Wedge was selected as wing-man because he is also pilot skill 6 and can re-position, has a great ability and is a steal for the points. Rock placement, Han's ability is amazing. I will spare you the math but if your opponent places the first rock and then you place your three no closer than range 2.5 from any other rock Han will gets a quasi lock (and defensive re-rolls) on over 75% of the board, potentially. 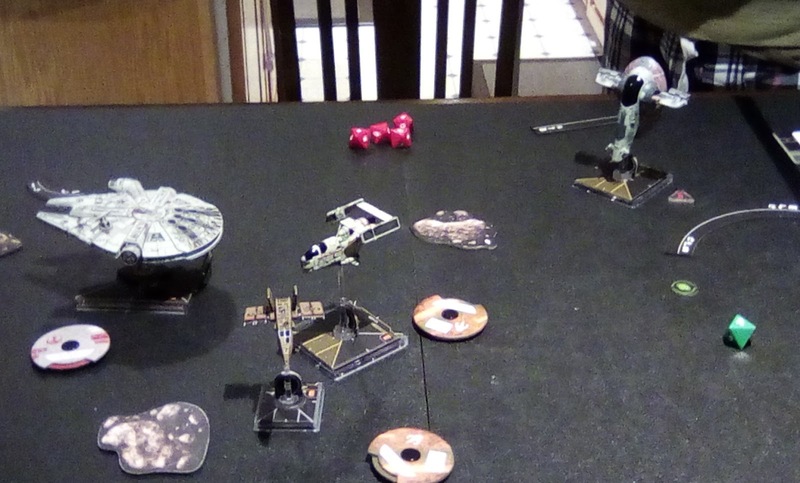 Approach, My two ships will stay close together with the falcon leading. 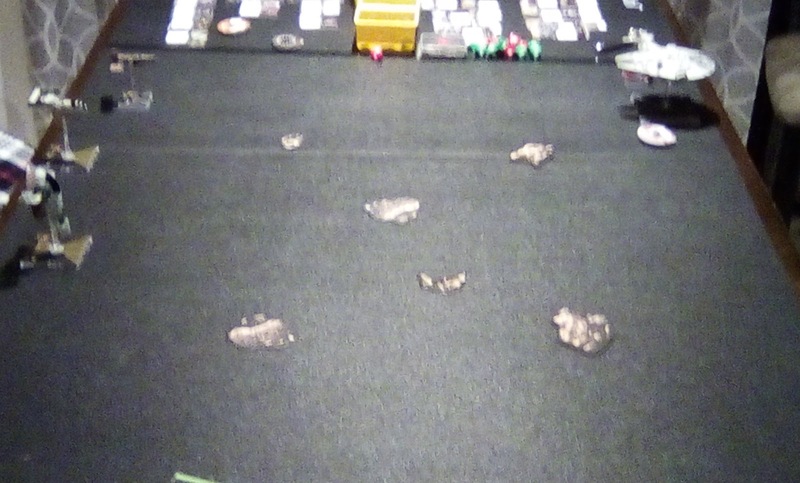 They will try and isolate first by being at range three of a flank and then the falcon will try to bump the wounded ship and Wedge will kill it since the defending ship will be down 2 green dice. The rest of the game will be sacrificing focus and lock actions for re-positioning, prioritizing staying out of arc and the cost of reduced effectiveness of red dice. Shouldn't be impossible for two PS 6 ships. Also both ships have innate abilities that improve their shootiness as long as Han stays near the rocks. The problem with 2 ship lists is keeping them alive. That is why Wedge has an extra hull and Han has the droid-wookie combo. My Opponent. Luckily only the host and I showed up so we played two games with the same lists. He net listed a beauty of a Scum list and it looked like this. A quick look at this list shows 9 red dice to my 6 and a lot more hit points. Also all the abilities work at range 1 (Palob 0-2). So it wants to trap my ships at range one. His weakness is maneuverability and speed. 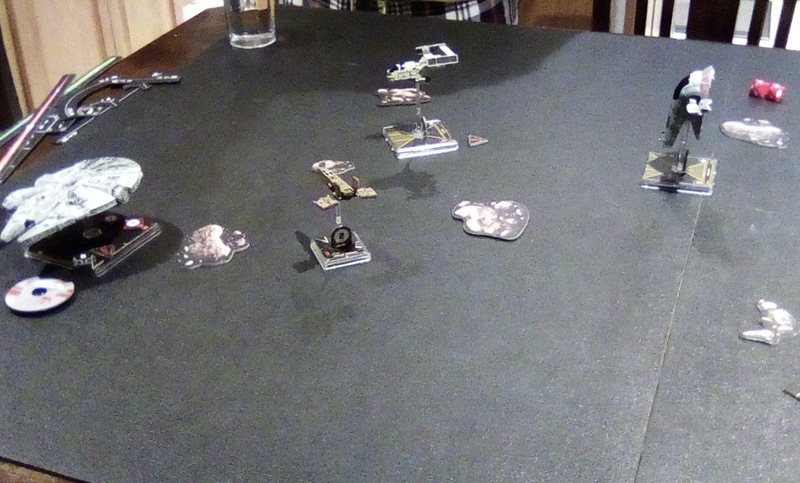 This crummy photo shows me trying to set up opposite Palob to isolate and kill him quick as he is the weakest of the three enemies. Sadly my joust was ineffective to say the least, and I misread where Palob would be for the bump. It also set the falcon up to almost fly off the board and get cornered without rocks. 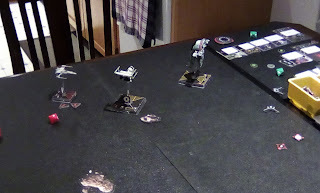 Han didn't fly off the board... he did get Palob, eventually, but died in the process. Game 2 was quite different. The Scum list deployed tighter and I flew right into their jaws. All of this resulted in lots of red dice and a dead Wedge, the scum ships did take some damage but it was spread out. But after that, the falcon took off for the other side of the board (around the rocks this time) with the three scum ships in pursuit, Boba had to K turn and was quite far behind. After a couple swerves around the asteroids all the while plinking a scum shield here and there it began to look up for me. Where did that come from? 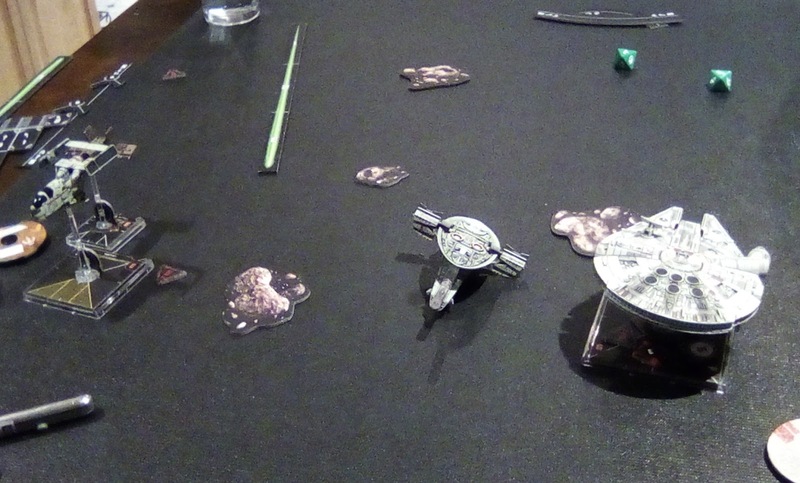 What had happened was in my panicked flight and his frenzied chase, he had strung out his ships and allowed me to isolate them with range and rocks. As the intergalactic dust settled I think that the critical factor in the first game was that I left the rocks and didn't play defensively (didn't stick to my strategy) and in the second game I managed to stick to my strategy, possibly by accident, but my opponent also should have stuck to his by regrouping for another joust instead of pursuing in the long line that he did. As always hindsight is 20:20 and it is better to be lucky than good.